Single-turn wave springs are ideal for bearing preload. The spring preloads the bearing through its outer race, taking up play in the bearing. This reduces bearing damage, wear, noise and vibration. Smalley has stock parts from 1/4" to 16". Specials are available from .200" to 120". 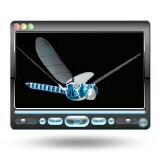 Click here to see application examples and stock sizes. Is PETMAN a warfighting droid? Cover Image: Brady Kappius and his carbon-fiber hub and laser-sintered bike drive components. The 0816...SR from MICROMO has continuous torque up to 0.7 mNm and a stall torque of 1.2 mNm. Weighing in at just 4.5 g, the 0816...SR is the perfect choice for applications where light weight and high torque are essential. These coreless DC Micro Motors are highly efficient by design and ideal for battery-operated device integration. Click here to learn more about this DC motor. The practice of bonding Liquid Silicone Rubber (LSR) to rigid thermoplastic parts has traditionally consisted of molding the individual elements separately and then assembling them into a completed product using adhesives. Today, companies like Rogan Corporation have taken that process one huge step further -- by molding Bondable Liquid Silicone Rubbers (BLSR) and thermoplastics using a two-step molding process. This article includes 6 Critical Design Considerations for BLSR/thermoplastic molding. 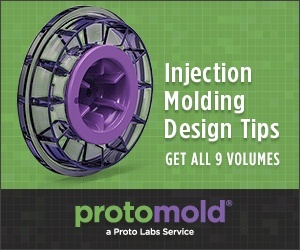 Love the Protomold injection-molding design tips you read in Designfax? Now get all 9 volumes of these invaluable lessons at no cost. High-speed flywheels are a cheap and efficient way to hybridize systems from cars, elevators, and industrial machinery to inter-city trains. Yet until now their development has been hindered by the lack of a robust way to transmit the power to and from them. Jesse Crosse reports on some ingenious new developments at Ricardo. Power Practical, a student startup that sprang from research at the University of Utah, is selling a portable thermoelectric cook pot that transforms heat and water into a power source to charge cellphones and other devices. About four years ago, Russell Kappius -- mountain-bike enthusiast, winner of six Masters racing titles, and a research geophysicist/software developer -- became obsessed with bicycle hubs. After working out a design for a novel oversized hub and high-performance drive assembly that would transfer more power from pedal to chain to wheel, he looked to direct metal laser sintering (DMLS), an additive manufacturing (3D printing) technology, to produce complex parts quickly to exacting specifications. Smalley Steel Ring Company has released its 2013 50th Anniversary Parts and Engineering Catalog. The new catalog combines previously existing Spirolox Retaining Ring and Wave Spring series with newly released series. Smalley's recently released Metric Hoopster and Laminar Seal Rings catalog has also been incorporated into this new offering. Congrats to Smalley! Check out Smalley's new catalog. Lead screws use the helix angle of the thread to convert rotary motion to linear motion. Learn all about their benefits, performance characteristics, design choices, lifecycles, and more in this in-depth article from Thomson Industries. EXOR offers the world's largest family of human-machine interface (HMI) solutions to meet the needs of your application and budget. 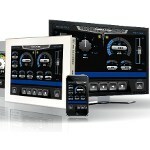 Their HMI panels come in more than 100 configurations ranging from simple graphical entry-level displays to low-cost touchscreens and advanced color graphic displays and touchscreen units. Solutions include more than 200 communication drivers, including connection to the most popular fieldbus networks and several industrial Ethernet protocols. Optional PLC modules can expand control system access to mobile devices. Available through Servo2Go. Applied Robotics has re-released its durable and reliable heavy-duty bag gripper (HDBG) with a lower price, reflecting a comprehensive engineering effort to cost the unit down. The HDBG has been working in material handling applications all over the world packaging, palletizing, and moving all sorts of products over 50 lb. The flexible and lighter design gives the unit many advantages. The BGS06 linear rail with integrated IDEA Drive from Haydon Kerk Motion Solutions is a versatile system utilizing the popular size 17 single-stack or double-stack stepper motor linear actuator with an integrated and fully programmable stepper motor controller. The stainless steel lead screw drives a precision nut embedded in a machined aluminum carriage mounted to a stainless steel ball rail. The result is a rigid, smooth-operating motion system. Max stroke length is 24 in. ; max horizontal load is 135 lb. The U.S. military relies on the space-based Global Positioning System (GPS) to aid air, land, and sea navigation. Like the GPS units in many automobiles today, a simple receiver and some processing power is all that is needed for accurate navigation. But what if the GPS satellites suddenly became unavailable due to malfunction, enemy action, or simple interference, such as driving into a tunnel? NASA's remotely piloted X-48C hybrid-wing-body subscale aircraft, which demonstrates technology concepts for cleaner and quieter commercial air travel, completed an eight-month flight research campaign on April 9. Building an N-gauge (1:160) model train system involves working with very small units. The 1930s-inspired BR 70 locomotive from Fleischmann is only 2.25 in. long when measured buffer to buffer. As on large locomotives, traction (and on the model, power transmission) between the wheel and the track is a crucial factor. To give the unit appropriately scaled big-train power with low vibration and noise, the folks at Fleischmann turned to customized DC motors from the FAULHABER Group. Is PETMAN a warfighting droid in training? Boston Dynamics, famous for its BigDog four-legged military pack-animal bot that can carry hundreds of pounds, developed the PETMAN robot for the DoD to test the performance of protective clothing designed for hazardous environments. But doesn't it look capable of so much more? PETMAN has sensors embedded in its skin that detect any chemicals leaking through the suit. The skin also maintains a micro-climate inside the clothing by sweating and regulating temperature. After tackling accurate (and mesmerizing) robotic bird flight in 2010, the mechatronics experts at Festo have turned their substantial creative talents to modeling the dragonfly at a technical level. The 175-g "BionicOpter" is a 63-cm-wide ultralight carbon-fiber/foil bot that can fly in all directions and execute complicated flight maneuvers -- all controlled by smartphone. It can move each of its wings independently, so it can slow down, turn abruptly, accelerate swiftly, and even fly backwards. Sensors, actuators, and mechanical components, as well as open- and closed-loop control systems, are all installed in a very tight space. The flapping frequency, amplitude, and angle of incidence are controlled by software and electronics, so piloting the dragonfly is quite simple. Intelligent kinematics correct any vibrations during flight and ensure flight stability. In order to stabilize the bot, data on the position and the twisting of the wings is continuously recorded and evaluated in real time during flight.